I have been a convert to Venezuelan food for quite some time. It all started with my father, a certified “Disney nut” who made the yearly pilgrimage to Orlando, Florida. A few years ago, I was lucky enough to stumble across another Orlando attraction, the Venezuelan Q'Kenan Restaurant, which opened my eyes to the glory of the arepa. An arepa is a sandwich with a shape similar to a small pita, except the unleavened dough is made from maize. Arepa dough can be grilled, fried or steamed, and stuffed with fillings from black beans and steamed plantains to ham and cheese. 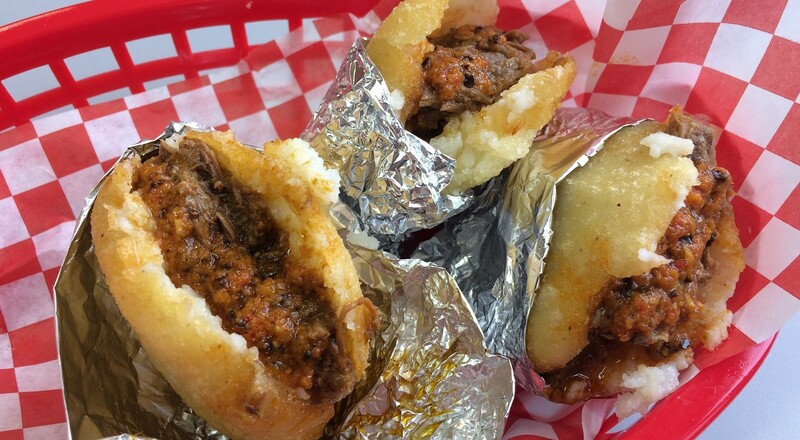 Arepas are perfect for anything from an early breakfast, to a late night, post-imbibing snack. Locally, arepas can be found at the Rochester-based Hello Arepa food truck, but until the opening of Ranchos Latin Food there was to nowhere in Buffalo to consistently get your arepa fix. Ranchos Latin Food recently opened on the day after Christmas at the site of the former Rascals on Niagara Street in Buffalo. This restaurant still has the red and white mirrored theme of Rascals, but I would say the food has improved substantially. They offer counter service with a spacious patio and plenty of indoor seating. Ranchos was opened by Joel (pronounced with two syllables) Perez, who hails from Aragua, Venezuela and recently relocated to Buffalo, New York. The move from the equatorial Venezuela is a drastic change for Perez, who cites Buffalo’s cleanliness his love of the four seasons as his motivation to relocate. Perez has several friends in the area, who are now helping him run the restaurant, and when he realized the large gaping hole where Venezuelan food should be, decided to move here and fill that gap, he said. Ranchos fries their arepas leaving it crunchy on the outside and soft on the inside, with that wonderful roast maize aroma. While the frying did leave the shell a bit crumbly, and slightly on the greasy side it was held together with aluminum foil. The shredded beef was tender, and full of flavor and spice, especially with the salsa rojo. However, my eating companions – my wife and 11-year-old stepson – agreed with me that the winner was clearly the roast pork. In my book, no area of the world does roast pork as well as the Latin nations, with the best examples featuring meat that is not only succulent and “porky,” but shredded and crispy at the same time. Ranchos' pork also had a slight hint of smoke, making it that much better. Perez's cousin Valentine Perez suggested the Venezuelan tequeños, or cheese sticks stuffed with queso blanco, similar to mozzarella ($1.50, 3 for $4). What separates these tequeños from your average cheese sticks is the wonderful garlic and herb salsa which accompanied them. We also tried a tequeño stuffed with queso blanco and guava jelly, which was also quite wonderful and a rare find in this area. Another of my favorite Venezuelan treats is the patacon pisao, a sandwich made of tostones (smashed and fried-until-crunchy plantain “bread”) stuffed with shredded beef. Ranchos fills their patacon ($7) with lettuce and tomato and smothers it in their garlic and herb salsa. The order came with two small sandwiches and was quite tasty. As I looked over the menu I noticed yuca, a starchy tuber similar but better than a potato as a side dish ($3) which I could not pass up, and which turned out to be one of my favorite dishes of the afternoon. The yuca is served peeled, baked and cooled, topped with a wonderful thick and flavorful avocado salsa, and is highly recommended as a healthier substitution to the ubiquitous French fry. Another rare find locally is sancocho ($8, weekends only), a richly flavored Venezuelan soup made with fall-off-the-bone chicken, chunks of braised, tender beef, cilantro, corn-on-the-cob, potato and starchy cassava. My wife and I agreed that this was our favorite dish of the meal. The broth was intensely flavored with the meat, cilantro and corn, getting a nice stickiness from the braised meats. The corn also soaked up all of the rich broth flavors creating a sweet treat. This dish is served with a side of rice and is highly recommended as a soulful weekend repast. According to my stepson, no Latin meal is complete without churros ($7 for 5). Here they arrived generously drizzled with Nutella. While these crunchy treats were quickly wolfed down by the happy little fella, I ended the meal with a Cuban coffee ($2), a shot of espresso sweetened with demerara sugar, made by Perez's good friend and assistant, Judy Garcia, who is of Cuban descent. She also offered me a complimentary Cuban favorite, café con leche, a sweetened espresso shot with milk, which I have grown to love from my time spent in Miami, served in the obligatory mini-cup. Whenever I'm driving by in the future in need of a quick pick-me-up, I'll be sure to stop by and grab one to go. Ranchos Latin Food fills a much needed gap in our local ethnic offerings. As the local Burmese restaurants stemming from our large Burmese refugee population have been locally embraced, I can only hope the same goes for the wonderful Venezuelan cuisine. Ranchos does a fine job of illustrating the spectrum of Venezuelan favorites in a clean and friendly environment. With plenty of empanadas on the menu, pepito sandwiches, and rice and beans, there is much I still want to try, and look forward to heading back there soon. Joseph Leta – Joseph A. Leta is an Amherst criminal, business and divorce attorney whose lifelong goal is to find the world's greatest foods, and eat them.